As a young freelancer bumming around the world, I quickly discovered the power of a piece of paper with a seal on it to get access, cross checkpoints, or sometimes even cross borders. I recall how embassy staff in Riga would reproduce “official” visa stamps using the wet edge of a sliced potato. It wasn’t just a matter of access, but one of safety too. As an identified member of the press, I was less vulnerable. In this increasingly freelance world, I’ve found fewer viable means to secure that accreditation. NYC police press passes are near impossible to obtain, and even the larger publications are stingy with business cards. But one affiliation I can prove is my membership in good standing as an active member of the Overseas Press Club. Shouldn’t I be able to show that at a checkpoint somewhere, the word PRESS visible, as I attempt to explain why I need to rush into a situation everyone else is fleeing? Or attempt to distinguish myself from tourists, or even soldiers? Now, the OPC board is pleased to be able to offer OPC photo ID card options for our working press members. Option One: A double-sided hard plastic ID card, similar in size to a credit card. 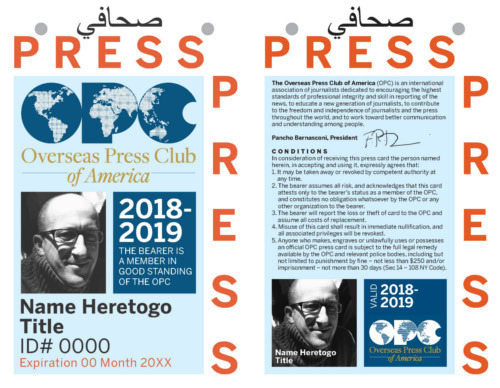 It is durable, bears the owner’s photo and the date of issue, and certifies that the bearer represents themselves as an active member of the OPC and active press. All members will have the option to request such an ID at no extra cost when renewing membership or joining the OPC; since the cards will be custom printed on-demand at OPC headquarters, members will also have the option to request a card at any point throughout the year, and have it shipped to their location. Option Two: A government or press-pass style Overseas Press Club ID that can be hung around the neck. This ID is also affixed with holograms for extra security. These IDs must be custom printed and thus will be available to members only in batch orders of 5 or more, for $40 each. Both ID’s have been custom designed specifically for the OPC by an outside contractor (GVA Designs). They can’t be easily copied, and, we believe, will give the bearer a little added official status at checkpoints and other access points. Please email patricia@opcofamerica.org if you want to order a free wallet card and/or a badge ID, along with a passport-style color front-facing face shot in a high-resolution jpeg. Please use images that are 1200 pixels by 1800 pixels and in color.A helpful way to confirm your photo’s dimensions is to upload your image at PicRezize.com. Windows: Find your image, right click and show Properties. Go to the Details tab and scroll to the images portion. Please use resolution no less than 300 DPI. If you don’t know if your photo is at the highest resolution suggested, you can check it on Convert.Town.